Today HockeyBookReviews.com is going to name the top hockey coffee table book of 2010. Canucks At 40 by Greg Douglas and Grant Kerr. Trust me when I say this was no easy decision. Sports Illustrated is legendary for their book series, and they did not disappoint with their long await hockey title. Not picking them was hard. Similar comments go for the latest Hockey Hall of Fame tribute to goalies.The Canucks title is a real strong seller, while He Shoots ... He Skewers, admittedly not a coffee table book by the classic definition, is just a real fun book to flip through. But there is something about The Golden Jet that I just love. It is an autobiographical coffee table book, loaded with amazing photo. 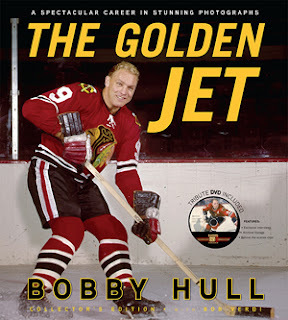 Bobby Hull provides the captions in what I think is a wonderful option for those who do not want to write a true autobiography. I love the idea behind this Triumph Books project so much that I sincerely hope the publisher will do all it can to use this format to create a series of coffee table autobiographies of the same high quality. Give us all the hockey greats - Gordie, Bobby, Wayne, Mario. Heck, expand it to other sports even.